Don’t be afraid of deconstruction! It is a liberating philosophical insight and process. If we are in prison and in shackles, we yearn to be released. Deconstruction is a way which can help to take the spiritual prison of deceptions and illusions of language and ideology apart and set us free. Take for instance that famous, almost proverbial, Allegory of the Cave from Plato’s Republic. It speaks about prisoners in the cave who see only shadows of real things. Philosophers, the enlightened minds, are the only ones who have the privilege of leaving the cave and seeing things as they truly are... But what if this entire allegory is just another kind of deceptive ideological prison? What if Plato, himself a philosopher, constructed this allegory to postulate for many generations to come the difference between the cave and true world of forms outside and to deny understanding to anybody but his own pals? This whole dialogue is, after all, proposing a society governed by philosophers. The whole Allegory of the Cave can be deconstructed as a self-promoting tool powered by flattery. In the early 18th century, Giovanni Battista Vico, the Italian philosopher and linguist noted a very radical thought: verum esse ipsum factum (The true itself is stated/made). He is considered the father of constructivist epistemology. According to this theory, we humans are the constructing authors of our culture, society, economy, justice system and science. The primary construct is our language, the very essence of our communication and the only tool of our own thinking. I think that Vico was right; everything in our understanding of the world is in the end our own human construct. 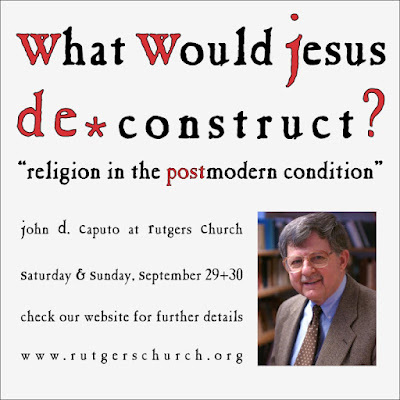 Here comes the good news of deconstruction. Everything that has been constructed can be also deconstructed; there are no untouchable constructs. If there is a thing which pretends to be untouchable and absolute, if there is a construct which claims authority over the lives of others, if there is a thing which controls or enslaves, such a thing should be the primary target for deconstructive probing. Nothing human is untouchable or holy. 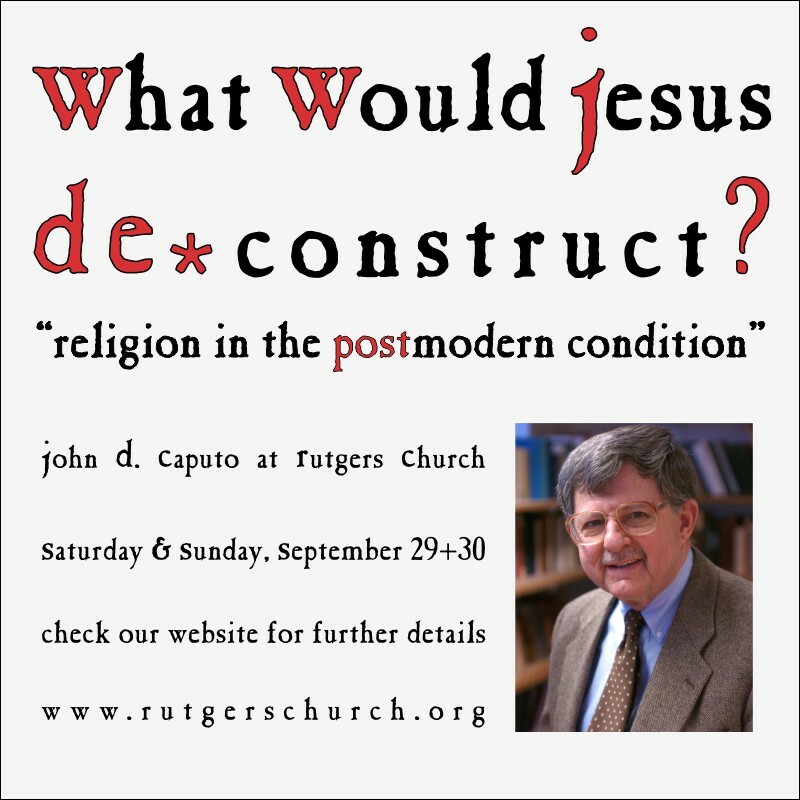 This weekend with our guest John Caputo we will look at what and how many of our social and religious structures Jesus would de*construct, and hopefully we will also touch that space of awakened and hesitant silence. Imagine that tomorrow morning all the Shakespeare’s Sonnets suddenly disappeared: from your library, from a public library and every library. The volumes would still be standing on the shelves, even the print in regular neat paragraphs would still cover the pages, but this beautiful Elizabethan love poetry would be mysteriously gone, simply not there any more, because this exquisite literature would suddenly be used in a different, weird and peculiar way – the sonnets would be used for weather forecasts not only above the British Isles but also all over the world. Television, radio, and the internet would not be showing weather readings and satellite and radar images, but only William’s poetic prosody. Academic climatologists would be developing highly sophisticated methods to utilize patterns in Shakespearean verbal tenses for describing and predicting El Niño phenomenon. Only Enlightenment theology started to appreciate Song of Songs for what it truly was rather for what it was not. Two centuries later, the situation still remains fluid and not completely clear. Many people don’t even know that the Bible contains beautiful, intimate, even quite racy love poetry. Many other don’t know what to think of it. This Sunday I would like to invite you to participate in rediscovering biblical love poetry and its potential to transform and nurture our lives and our faith. Welcome to our weekly program - A moment for spiritual growth - I am your host Beth Childs in studio 7 of the Heavenly Broadcasting Corporation here on the corner of Broadway and 73rd Street. This Program is brought to you today by The Genuine Scottish Oats - producing the PERFECT morning cereals for 452 years. One bowl of our celestial porridge in the morning makes you feel like a strong Presbyterian inside out and all day long. Beth: Now, Today I have with me in the studio a very special guest - Simeon, the fisherman, also known in Aramaic as Cephas, in Greek as Peter and in English as Rocky, preeminent disciple of Jesus, in some traditions head of the church and first bishop of Rome. St. Peter - welcome to our program. Peter: Thank you for having me. Beth: Without further ado I will start right away with the most intriguing question. I always wanted to ask you - did Jesus really call you Satan? Peter: Yes he did. Or do you think that I made it up? Beth: I did not mean that you made it up. What about the early church’s oral tradition? What about the evangelists? They write testimony about faith and not history. Aren’t they proverbially unreliable? Peter: Oh yes, they occasionally embellished and improved some stories. Sometimes they even made up stories of their own to make a point. But do you think that they would have made up such an unflattering story about me - one of the founding pillars of the church? Peter: I hope you understand that at that time, and in that context, the word “Satan” had not yet developed into a strong mythical, supra-natural character. That happened later. At our time in Galilee SATAN simply meant “a seducer”, “an adversary”. It was a name for a function, not for a demonic character. It wasn’t another name for the devil, It wasn’t another name for the alter ego of God - the ruler of the dark worlds. SATAN in Hebrew, SATANA in Aramaic, simply meant “the adversary”. Beth: Well, that is not all that helpful, is it? Satan or Seducer - how did you feel when your beloved master publicly called you seducer or ... ADVERSARY? Peter: How did I feel? Awful! Horrible! But let me backtrack a little – earlier that day I felt very hopeful, elated, almost exuberant. On the way to Caesarea Philippi Jesus asked us, his closest disciples, a question - "Who do people say that I am?" And we were in seventh heaven! Finally he got realistic! He started to pay attention to public opinion! (At least, so we thought.) Finally we could engage popular emotions and expectations! Finally we could tap into that powerful fountain of public anger and hopes! In no time, we could get a real and realistic big movement going. Until then, he was not real; he was losing so many potential supporters and powerful allies... At one moment, he was subverting Romans, the next time he healed a boyfriend of a Roman officer. One moment he criticized Pharisees, the next time he was at their table! He was asking about public opinion; that was to us a good sign! And then he even asked us "But who do you say that I am?" - I was so happy, finally we were talking real business, finally I had a chance to let him know how we can easily change our movement to make a real impact in this world, I almost exclaimed, I burst out - "You are the Messiah." And he? He rebuked me! He publicly humiliated me for confessing him to be the Messiah! Beth: Wait a moment, wait a moment! I thought that Jesus rebuked you only after you took him aside and started to talk him out of suffering? Peter: Oh no, it happened just like that, as I said. He rebuked me right away. What you have in the Bible is a later attempt to explain it step by step, by sequencing it, dividing it into several consecutive steps. In reality it happened all at once. I was full of hope and joy and expectation. I confessed him to be the victorious Messiah, and right away he rebuked me and called me Satan, just for calling him the Messiah! Beth: Aren’t people confessing Jesus as Messiah all the time? Does it mean that they (we?) are Satans? Peter: That is a very good question. It all depends on what you mean by Messiah, the kind of meaning you put into this word. That is one of the reasons this story was divided into those several stages. I called Jesus “Messiah” before the crucifixion and at that moment I wanted him to be a successful resistance leader who would change things by power from the top down. By ”Messiah” I meant the most successful and most powerful political figure, the avenger and victor. After the crucifixion, after his suffering - it all means something different. Suddenly when someone who was crucified is called Messiah, you do not worship worldly political success! When you declare someone who was crucified Messiah, you are raising your voice in protest against any and all inhumanity, against all humiliation of the powerless. Declaring someone who was crucified as the Messiah, points above and beyond, to something bigger and higher and more glorious. Peter: Not so fast, not so fast - again it very much depends on the context and your intentions. When you call Jesus the Messiah or Saviour in the midst of suffering, or when you feel pain for other people, when you care for them and want to help them, if it is your protest against injustice -- then it is OK. But when you call Jesus Messiah for political or personal agendas, if you call him Messiah to keep the oppression and injustice going, If you call him Messiah, to keep people in darkness, or to gain or retain your privileges or the easy life or anything else - oh, then it becomes truly very questionable. Beth: Aren’t people doing it all the time? Does it really mean that, at least to some degree, we are all Satans, tempters, and misunderstanding and misleading adversaries of the LORD? Peter: I am afraid it really may be so, and that is also the reason I am happy that my unflattering story is preserved in the Bible. My reputation is less important than this important warning and spiritual lesson. But please note, that Jesus didn’t say, “Go away Satan!” He said to me, “Satan, get behind me!” It can be translated, “Satan, follow!” He used the exactly same words which he used when he called me the first time to be his disciple! I was strongly rebuked, but I was not expelled. Even as a Satan, I was re-invited to discipleship. Beth: Do I hear you correctly saying that at different times and in different forms we all misunderstand, manipulate, even abuse Jesus’ legacy, that we all can be called SATANS and yet he still calls us and urges us to follow him? Peter: Yes, that is correct, Even though we are at times misled and are misusing his legacy for our own agendas, he still invites us to follow him. Jesus invites absolutely everybody to follow him, because in him and in his Gospel there is hidden this enormous power for good, which can endure the biggest temptations, master most difficult people and change even our most selfish agendas. Beth: Peter, who was once called Satan, thank you very much. Does anyone in our distinguished audience want to ask Peter a question? If not, I would like to invite you to our next program - next week we will be discussing the life and words of Somali poet Cilmi Boodheri and the surprising power of love poetry. beyond the reach of human mind. superlatives of power, wisdom, and goodness. and goodness in receiving sinful people. the purpose of God’s divine love. Religion is like a fire. Without fire we would not have civilization. On the other hand fire which gets out of control destroys and kills, often on large scale. Religions are just like that. They inspire the human spirit to create the most sublime masterpieces of art and to reach great heights of altruism and enlightenment. But religions can also get out of control. They can be abused for dangerous personal, national, or political agendas. If that happens, religions burn and destroy, imprison, enslave and kill with genocidal fanaticism. Every religion has this latent propensity to become surprisingly destructive and violent. All religious texts, myths, legends, hymns and prophecies known to me are surprisingly violent. Even the Song of Songs, the biblical love poetry, speaks about “the army marching to battle under flags”, “shields of warriors” and “battlements of fortresses”. There are even a few instances when Jesus seems to advocate violence, and honestly, an image of harvest (cutting down of wheat) isn’t a particularly peaceful image of upcoming judgement either. Most often these texts are explained as metaphors, and interpreted as spiritual parables highlighting the urgency of peace and justice. Unfortunately, in no time they can be taken literally and instigate religious riots, exonerate atrocities, and perpetuate oppression. Every religion has this potential. 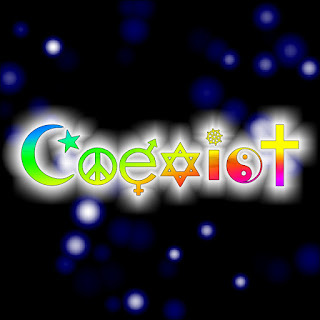 Every religion can be used and abused by religious, political or national zealots for their own agendas. I might be mistaken, but I think that irrational religious fanaticism has been on the rise for last several decades (and not only in Islam). Some thoughtful and sensitive people react to this nasty side of religion by abandoning religion altogether - to me that is like pretending that we can have civilization without the use of fire. I believe that we can enjoy the benefits of religion but at the same time every person of true faith must recognize the inherent religious danger and seek ways to guard their faith against such aberrations. This Sunday in the lectionary Gospel reading (Mark 8:27-33) we will see how Jesus addressed this very issue in the closest circle of his disciples. 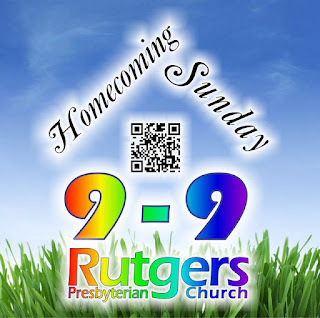 This Sunday we celebrate Homecoming. So, after summer, Welcome back to Rutgers Church! Many of us are returning from summer holidays and journeys, some short, some longer to distant lands. But even if you did not go for a long trip, or did not go away at all, all of us return changed and transformed by our summer experiences. As we come together again, we bring with us pieces of different cultures, landscapes, environments which got under our skin and stuck in our mind. We carry with us grains of dreams and different sights which we take home in our subconsciousness just like that little pile of forgotten sand in the bottom of a suitcase. Hopefully we also bring along (and will preserve at least for some time) that light summerly easy attitude of playfulness and readiness to try out new things. And yes, I must not forget one of the most important elements, we bring also along the thorns of hardships which we encountered on our summer journeys. But with memories of hardships we also bring news skills and creative ways which we learned to cope and overcome them. Indeed, exposure to different environments, other cultures and foreign languages have a profound influence on sensitive and receptive minds. This Sunday in our Bible reading (Mark 7:31-37) we will observe how Jesus returned from a foreign trip. Some (evangelicals) say he went on a mission trip, others (progressives) respond that most likely he was escaping political and religious persecution, he was a refugee. Anyhow, after returning home he performed a very unusual miracle healing. It was so controversial that it is preserved only in the oldest gospel - Mark. Other evangelists left it out. In this miracle story it seems that Jesus is behaving like a common pagan magician. I think that the Jesus of this story exemplifies for us how journeys can open our minds and bring healing and justice in new and surprising ways. It is a great and auspicious story for our homecoming and new school year. Mark 7:31-37 translated as it would be heard by the original recipients (Dynamic Equivalent Translation). Colloquial and clumsy language represents similar features of the original Greek text. Just then some people came bringing to him a deaf-and-dumb guy, and they are like asking him to put on him his healing hands. And he just took him away from that crowd, so they could be alone. Then he stuck his fingers into his ears, and he spat on his fingers and touched his tongue. And finally lifting up his eyes up to the heavens he groaned the word EPHPHATHAH – which translates - Be opened! And right there, they were really opened and his tongue was unchained, and he spoke just fine! Jesus gave them a command, “Say nothing, to nobody!” But he could tell them whatever he wanted, they talked it up all the more. They were beside themselves just saying: He sets everything right again! Even the deaf can hear and the speechless do speak! I have been always intrigued by the magical plasticity of our perception and how it alters our understanding of the world and informs and broadens our decision making. Take for instance the famous upside-down perception experiments. Neuroscietists fitted people with semi-permanent goggles which turned their vision upside down. Understandably, first several days were almost unsurvivable for everyone. On the fourth and later days participants started to cope and soon they lived almost as if they did not wear these perception altering glasses, they were even able to ride a bicycle for instance. When they took the glasses off again, their perception returned instantly or soon. As I am writing this article, we are returning from summer holidays in Dominica, an island member of the British Commonwealth. It is an almost dizzying experience to drive on the left side of the road. It vividly reminded me of my seminary year in Scotland. Driving on an opposite side of the road is difficult, strangely, being a pedestrian, is not much better. For a day or two I did not know where to look first. Many times over I was surprised by honking and occasional squeaking of the brakes coming at me from strange and “wrong” directions. After about two days it got better. Our view of the world, our inner image of the world and our position in it is result of our psychological and cultural influences and viewpoints. 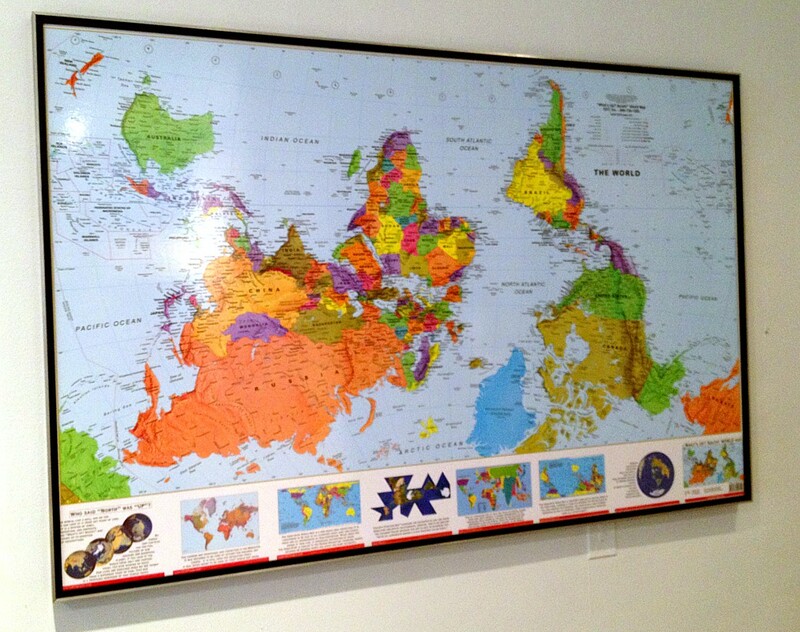 For instance, do you know, how Australians view the world? It isn’t upside down, but it isn’t so much different. Just look at Australian maps! I had a very early introduction to the Australian world view because my first English teacher had some Australian friends. Thus in the third or fourth grade I learned to appreciate the fact, that the image of the world is a reflection of our cultural and psychological predispositions, and our cultural and educational influences. 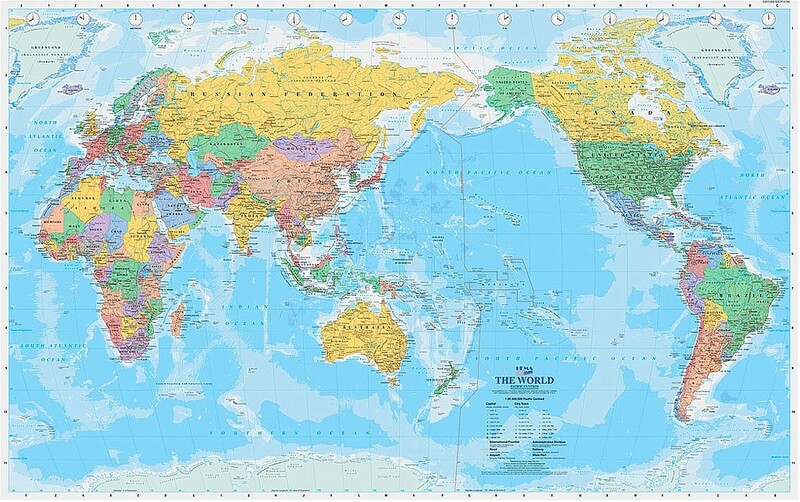 Australians do what we all do - view ourselves in the center of the world. Unfortunately many people are mentally lazy, and thus are not conscious of this fact. In addition, their world can be quite small, even in one of the largest metropolises of our planet. Mental images of the world for many people are built around their persons and don’t reach beyond their longest shopping trip. This map is arbitrary like any other cultural convention, yet how profoundly it can change our perspective of the world. Momentarily it can put us out of balance. However, it can help us to realize how much our outlook is a self-centered cultural prejudice. Expanding our personal horizons can lead us to become more humble and open minded, especially when we realize it is not just an intellectual prank, it is a lived reality. True Christian faith, faith, which is not just another cultural convention or ritual, real faith, deep and unpretentious faith which enjoys and welcomes challenges, is a prime example of life changing and dimensions expanding experience. In the moment when we encounter it, it can give us headaches because it has tendency to turn everything upside down. A first reaction is often rejection or dismissal, but when taken in as a challenge and processed and accepted, this transformative faith has the potential to broaden life and change life perspectives. In our open-minded and progressive faith we go against the stream of our environment (either secular or conservative Christian). We continue turning expectations, conventions and prejudices on their heads and thus continue living our Christian faith openly and honestly.